"There is no easy Ironman. There's hard, harder, hardest and then Wales." The words spoken to us by the voice of Ironman, Paul Kaye, at the race briefing the Friday before the big day. Butterflies filled my stomach. Get comfy as this is going to be a rather lengthy post, but I wanted to share my Ironman story with you - as well as having something to look back on. The journey to the start line. 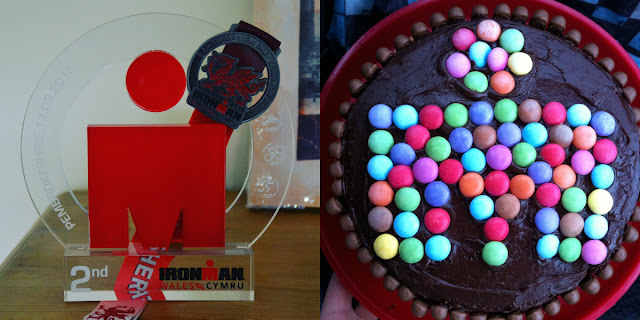 After being inspired by Sophie Radcliffe I took the plunge last October and signed up to compete in Ironman Wales 2015. The journey would be long and hard, but once the idea of signing up had been planted I couldn't shake it. My thought process was - you can do it you just need to sign up for it. You need to train and dedicate yourself to it. I’d had the same thoughts when I decided I wanted to run my first half marathon. Although this event would be a lot tougher - 2.4 miles of swimming, 112 miles of cycling, and then a marathon - in my head the principal remained the same. Give it your all and (hopefully) the results will come. I trained hard over the following months building up from a pretty low level of cycling. I swam miles in the pool, joined a tri club, cycled some more, ran, spent Monday evenings in the open water, spent many early hours on the bike and then; ran, swam & cycled some more. Just under a year later it was time to head to Tenby and see what results that year of training would bring. In the day leading up the race I'd mostly avoided the weather forecast. I knew the weather would change a lot and panicking wasn't going to help. On the Ironman Wales Journey Facebook page people were posting regular updates. One minute sun & minimal wind, then a couple of hours later thunderstorms were showing. I tried to ignore the forecast as much as possible over the following days. In terms of training during race week I swam, ran and cycled. One last open water swim on the Monday to do a final outfit check, a short 20 mile cycle on the Tuesday, run on the Wednesday, swim Thursday and then rest Friday. That was it. Short and simple. Once we’d arrived in Tenby and checked into our B&B we made our way to register. Picked up my backpack and signed the waiver. Back to the B&B before it was off to the race briefing. “The swim this year will be a rolling start.” This had happened at Bolton in July and since then there had been rumors that the same may happen to Wales. When this was announced I have to admit I was at first slightly disappointed. I was ready for the washing machine and the sea of athletes heading into the water. Looking back on it, post race, it was a decision that was very much appreciated. I think it helped a lot of people and gave them a bit more space in the water with the staggered start. However, even with the extra space I still ended up getting hit in the head and pushed under a couple of times. I probably gave as good as I got though... The rest of the rules were read through - feed station locations were confirmed, along with the cut off times. About 60 minutes later it was over. Off to Top Joe’s Pizza – the best place for pizza in Tenby and I HIGHLY recommend you pay it a visit. When my stomach was full, it was time to fill my transition bags. I’d packed my kit into separate bags for the journey up to make it easier but couldn’t help myself constantly checking once I’d packed my transition kit. I was worried I’d missed something – I definitely hadn’t. One last check and I called it day. There was no more I could do. Alarm set, then sleep. The day before an Ironman. 7am wake up - a rare occasion when you're up each Saturday at 5am to get ready for work. A fairly relaxed day was ahead. Quick change and I took my bike for a short spin to check everything was working, thankfully all seemed okay. I took the short ride to North Beach and enjoyed the peace and calm with no one around before the big day. One last loop and back to the B&B for a teeny run to check the legs. Just before 8 I was suited in my wetsuit ready for the practice swim. The sea was warm still and welcoming. I ended up doing three laps of the course (much shorter than the official course) and spent around 40 minutes just taking it all in. I love swimming and it had been one of my favourite sessions during training. Taking to people afterwards we all agreed that this would be lovely condtions on race day. Would they hold out? Once out the water it was time for breakfast and then off to rack the bike. Rack the bike, rack the transition bags, collect timing chip. A walk to the expo and then back to the B&B. I was then informed that Arena were selling ladies swimsuits for £5 so it was back to the expo to pick up a bargain. A few hours then passed before I went to meet my friends Abi & Darren who’d come up for the weekend and are from my triathlon club. We chatted over a cup of tea which was over all too soon, as I received tips on the course. Big hugs and then back to the B&B for crackers and jam. 8:30pm and the amazing Charlie Brown gave me the world’s most awesome facetime chat. Charlie knows the self doubt that plauged my mind but this chat helped me relax a bit more and focus on taking things as they came – one step at a time. Having those five minutes before the day helped in larger amounts than I think many people will understand. She and Paulie wished me luck and it was soon 9pm. I set my alarm & it was then bedtime. 3:50am Alarm sounds - I sat upright. I wasn't tired. I was just thinking straight to the events that would be the day ahead. By 4:15am I had eaten my breakfast - 2 large shredded wheat and 2 bananas. Then I started to get ready. I put my headphones in watched and watched thisvideo numerous times. I then watched this one. I’m not normally one for motivational videos but these just seemed to help on race day. 5:15am Head to transition. Bottles on, bike nutrition in top bar bag and a quick press of the tires to make sure they’re still inflated. (I'd just like to mention at this point I had zero idea about my tyre pressues - I merely pressed them multiple times to make sure that A. they hadn't deflated and B. to make it look like I knew what I was doing. Secretly I had no clue - I just knew they were inflated and would be okay.) I checked the bike was in the right gear and that was it. The next time I'd see my bike it would be at the start of a 112 mile journey. We headed back to the B&B to "relax" for about half an hour before making our way to the beach. 6:10am We were staying less than 3 minutes brisk walk away so I quickly found myself at the top of North Beach. The crowds were already building, as family and friends see their competitors head down the ramp. I applied vaseline everywhere said goodbye and hugged my dad before I made my way down with others. I racked my purple bag, containing my transition run shoes, and then tried taking it all in. This was actually happening. I looked out towards Gosker rock initially confused as to which side I would be swimming on it when I returned on the last leg of each lap. A minor detail I probably should have made sure I'd known. I then realised there’d be hundreds of other swimmers in the water with me – I’d soon find out. I found a spot to myself and was super happy to hear someone shout my name – Cat had found me! We hugged and had a quick chat. We then ran across the sand and jumped into the water. Wetsuits flooded we headed back out. My warm up was short and sweet - I didn’t fancy doing anymore. We made our way to the starting pens and soaked it all in with music blaring across the speakers and the quiet murmurings of fellow compeitiors. Everyone here had trained for many month’s, maybe years, to reach this point. Soon after, the National Anthem played. This was it. It was happening. The time had nearly arrived. We wished each other luck and everyone's mood changed slightly. 6:55am The pros set off. Just after 7am - It's my turn. The crowd starts to move. I see the clock, hear the timing chip beep, no other thoughts, into the water and that's it. My arms start moving, I start kicking my legs and the swim begins. 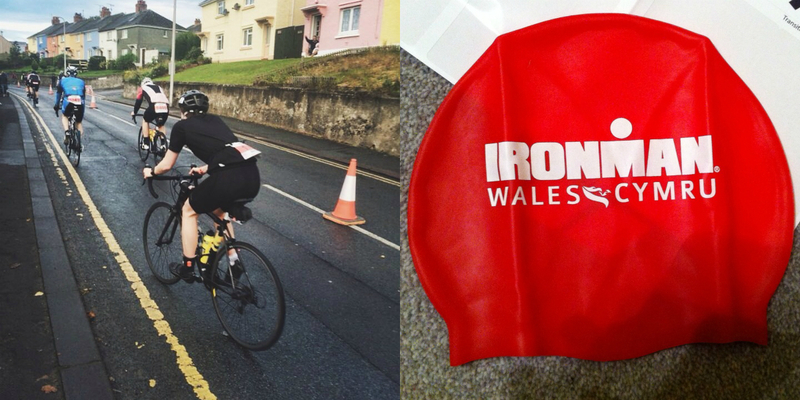 The year leading up to Ironman Wales had mainly been filled with doubts about my cycling ability. Whenever anyone asked how I felt about the race, or asked what time I was aiming for, I always replied the same way - I just don't want to get cut off on the bike. If I make the bike cut off I'll be extremely happy. I don't care what time I finish in, I just want to finish. Setting off onto the bike course I knew what was ahead of me - I'd recce'd the course back in July and had been surprised at my avg speed. On the day I KNEW I could replicate that speed, I just had to deliver the results. I paced it well and took the first stretch steadily. I didn’t push too much and knew my legs would thank me later on. My speed was good and consistent. Around ¾’s of the way through the first lap Alex, who I’d met in transition the day before, passed behind me shouting my name. It was lovely having someone to chat to during the race and my mood instantly lifted. It’s a long day on the bike so it’s great to break it up by chatting with others. After 56 miles of undulating course you hit the first of the “major three” hills. Narbeth was filled with music cheering and huge crowds. I took it steady and soon was at the top. One major down, two to go on this first lap. The 16% delight that is Wiseman’s Bridge was next up. I again took it steady trying not to burst out my seat and give it my all to the top. A short decent brings you down into Saundersfoot. THIS is the moment that people say is like the Tour de France. It certainly lives up to the hype. As you head up on the first hill you end up forming a single file line. I sat behind one lady, trying to avoid her wheel. The 10m drafting policy is certainly not followed here! They were shouts of “allez, allez” with others saying “keep steady, keep chipping away”. You take that first hill with a huge grin on your face. I remained seated trying to avoid pushing it too much. I knew I’d be back here again in a couple of hours. After a gradual climb out of Saundersfoot you begin the short descent, sweeping back into Tenby. 70 miles later, I’d made the first cut off. I hadn't ruined my legs and I'd actually made the cut off - more disbelief is occurring here. I set off for the second lap and to face the hills again. Had I pushed too hard? I was feeling okay at this point and still quite in shock that I had actually made it with good time to spare. Repeat Narbeth, Wiseman’s and Saundersfoot before coming back down into Tenby ready for T2. Coming into transition I see my friends Abi & Darren. I saw them at the very beginning of the bike and here they were again cheering from just outside transition. 112 miles after I first clipped in I was back in transition and I made it. I’d actually made it. Now it was time for the final leg. I had over 7 hours to do a marathon. I knew I could make it all I had to do was keep moving forward. I ran out of transition – another full outfit change into run gear. Once again I saw Abi & Darren. I gave them a hug and high five before wishing them a safe journey home. "Hilly" is used to described the Wales run. Yep, they are correct in that. Essentially 3 miles up hill, then 3 miles down - repeated 4 times, with a weave around the streets of Tenby to round up the numbers on each lap. I knew this would be hilly so had formed an approach to get my round. I had the plan of - walk uphill if I had to and run down using gravity to help. The first lap wasn't completely smooth sailing. Running out of town I felt great – I was doing this, I was happy! Then I met the first hill. It was a bit of a shock to my legs. Taking it steady, I ran when I could and if I walked I then would run to round up the mile - after a short walk break. This helped and got me up the hill. Now I knew what to expect for the other 3 laps. My mood dropped a lot that first lap. I think I was underfuelled, as when I began eating properly on the second I was a completely different person. I got into a good rhythm on lap two ,taking the hills one at a time and trying to push it a bit more downhill. I kept my pace steady to ensure I wasn’t peaking too soon. Lap three. The penultimate time I’d be heading up THAT hill. I collected my red band and made my way back into Tenby. Turning right for the last time, I ran through and out the town. I knew this was the last time I’d be facing this hill. I reached the top of the hill, after essentially walking the whole way up and thanked the group that had cheered me on each time I passed them. Just the short uphill section left that takes you to the band collection. All four bands were on my arm – yellow, blue, red and now, green. This meant I was on my way back to Tenby for the final time. 3 miles downhill, weaved around the town and you reach the moment you can finally turn left. Anyone who saw me on that fourth lap would have seen me shaking my head in more disbelief. I had done it. I'd actually done it. As I turned left and took that last corner I saw the lights and heard the crowds. The ground turned red, as concrete was replaced with red carpet. I saw the clocked and sprinted – although it looks a lot slower on the webcam! Then I crossed the line as Joanne Murphy said the words “Abigail YOU ARE AN IRONMAN.” A huge feeling of relief fell over me. I collected my medal and shook the Mayor’s hand. The red carpet moment was over almost as quickly as it had begun. I walked into the finishers tent and the smell of pizza hit me. Straight to the food table - first a piece of apple, followed swiftly by a piece of swiss roll, then pizza, then another piece of swiss roll. I forgot to pick up my finishers t-shirt, so I head back to get that. I went to collect my bags and bike and find my Dad (after having to use a lovely volunteer’s phone in the transition tent as I had no idea where to meet him!). Hugged my dad and we began the short walk home. Or rather I then got on my bike and cycled the short distance back to the B&B. I did get a couple of bemused looks from fellow finishers as I cycled past, but all I wanted to do was sit down. My legs felt fine - not so much the tops of my feet. Back at the B&B and after a celebratory drinks and nibbles I was informed that I may have come second in my age group. More disbelief (maybe I need to work on my self confidence a bit more?). "Well that might not be true there may be something wrong." No matter how many times I was told that they were in fact the final results I still didn't want to believe them. Turns out that I had in fact actually come second in my age group. After checking numerous times, including after midnight the numbers hadn't change - I had finished in second position. I showered and washed my hair before heading back to the finish line to cheer my awesome friend Cat across the finish line with her parents and her flatmate Erin. I'd seen Cat on my last lap of the run as I headed up the hill for a final time, she was heading back down. As I made my way back, with that incredible green band on my arm, I saw Cat again. Her leg was giving her major issues. I gave her a huge hug and walked with her before she sent me on her way. I told her multiple times that she was going to finish. She had plenty of time, she just had to keep moving. To see her cross the line was a fantastic experience and I was super proud of her for everything she'd done that day and during the months of training. We took the walk back to the B&B once more before heading to bed. Monday 14th September. The day after. After a midnight bedtime and the events of the day before, I could only muster 4 hours of sleep in total. Sophie had said I probably wouldn't get much sleep that night. She was definitely right. I was up at 5 headed downstairs and read - Iron War incase you were wondering. Back upstairs at 7:30am to get ready for the day and a celebratory breakfast with everyone who stayed at the B&B at 9am. There were three rooms at our B&B and all three of us competed and finished Wales. It was such a great feeling seeing everyone in the morning and chatting about the event. IronMan Wales 2015 Highlights from SkyCam Wales on Vimeo. Then it was off to Carew Airfield for the Awards Ceremony and Kona slot allocation. At this point I still somehow wasn't convinced I was going to receive an AG prize. I knew the top three in each age group would get a prize but I still wasn't quite ready to believe it. We had a second breakfast whilst watching a video of footage taken during the day (video above by SkyCam) and watched as some incredible photos were shown. It was soon awards time. After the pros had received their prizes it was the age groupers turn, beginning with my age group - females then males, starting with 3rd place. When I heard Paul Kaye say my name I made my way onto the stage shook Jesse Thomas' hand and thanked him as he handed over the trophy. It was his first Ironman as well and he did an amazing time - he was actually finishing as I headed out for my run! As first place collected her prize she shook my hand and we stood for a photo. It was all a bit of a blur. I was standing on stage, people clapping with multiple cameras taking photos. Definitely an amazing experience. It was soon time for the Kona roll down. I knew that I sadly wouldn't be heading to Kona as we only have one slot in our age category. Jodie who did an incredible job (coming first by over 2 hours!) looked incredibly ready to take it. Once the ceremony was finished it was time to head home. We said goodbye to Cat and her parents and made the journey back to Cornwall – trophy on lap all the way. Ironman blues began incredibly quickly. The Ironman motto is "Anything is possible". Anything really is possible. I said I'd only ever do the one Ironman. The day after I was already looking at races for 2016. I loved the distance and the whole journey of training to get to that point. I wanted to repeat it all over again. And fingers crossed I will. A big thank you to every single person that I’ve spoken to during training, has wished me luck, or dealt with my questioning my ability. To my parents and friends who dealt with my every changing moods. To everyone at my triathlon club from those who I trained with to the coaches that helped me along the way - Abi & Darren - who took the photo of me above, Jane who made the ACE cake and also had to deal with my mood when I had a severe bonk one training ride.Carly for the early rides, Luke for the battles during some of the first open water swimming seasons and Shane - who I shouted at when I only had to run one more lap... To everyone else at Plymouth Triathlon - major thank yous go to you all! I only joined in January but feel like I’ve been part of for years. To Cat for her ever encouraging words as we made the journey to the start line together. To Sophie for the inspiration and motivation to sign up in the first place. To Charlie for the world’s most amazing pep talk the night before. To James for helping me with my cycling and all the constant worries about my speed. And to Hannah, Jen, Cathy, Sarah, Cat, Sophie, Sarah, Charlie, Lucy, Charlie, Sophie, Cara, Sorrell, Susie, Victoria, Emily, David, Paulie, Mel, as well as many more that sent messages before the race (sorry if I've left anyone out!!) And also a final thank you to the people of Pembrokeshire who made my first Ironman event a pretty magical experience. You're support was insane throughout the day - from 6am on the beach right through until the final finishers at midnight. You did so brilliantly!!! Well done! Fab report too! !